We all love Mary Anne Hobbs, don’t we? She has given us so much great music through her radio show and compilations on Planet Mu. So it was an honour to receive a promo of her latest compilation album Wild Angels. Wild Angels has a distinguished dark feeling to it that seem to be intentional from Mary Anne. It explores the subgenres that she plays on and the album is able to extract the essence of the show. All in all I love the Wild Angels compilation! It is filled with strong tunes (with a couple of exceptions) for everyone interested in bass-driven music and it is definitely a compilation worthy of your record collection. I give it 5 out 6 Core News-stars. 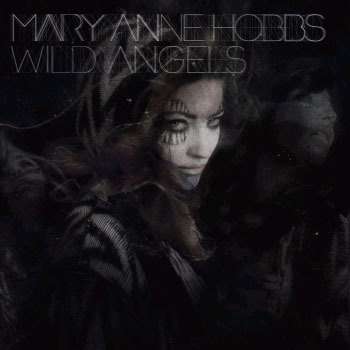 Mary Anne Hobbs – Wild Angels can be bought from Amazon as CD , vinyl and MP3 -release. Here are short reviews of each track with mp3-links to preview them. 1. Mark Pritchard – ? The opening tune of Wild Angels is simply called “?” by Mark Pritchard. It is a moody piece of music that works great as an opening track on this “dark” compilation. The most ambient tune on the CD. I like it! Hudson Mohawke gives us a track called Spotted that has eclectic Hip Hop feel to it. It is pretty good, but I prefer other tunes on Wild Angels. Next up we get the track Knock Knock from Mike Slott. I feel it is in a bit the same vein as the one from Hudson Mohawke. Not really my style, but still cool. Brackles got a downright ridiculous great tune on the album. It’s called LHC and fills me with joy. Might be one of my favorite tracks of 2009. Rainbow Road by Gemmy is one fine dubstep tune that I’ve enjoyed a lot. Untold is representing the darker and heavier side with Discipline. Some really heavy, rolling basslines in this one that make you wanna move slowly around the dance floor like you are caressing the music..
Next up is Tranqill with a track called Payroll in a Paul White’s Clean Dub that starts up like a Prince track and then moves on to sound a bit like DJ Shadow. Love the bassline on this one with its wobbly movements. I enjoy the DJ sets Rustie play and his tune Zig-Zag on Wild Angels is loveable too. To me it sounds a bit chaotic, but it still has a nice structure. I discovered Mono/Poly through the Mary Anne Hobbs show. The track Red And Yellow Toys. Think experimental hip hop on this one. We Should Light A Fire is a perfect track for long summer nights while you are sitting with your girl by a bonfire. It is evocative yet massive. One of my faves on Wild Angels! 12. Starkey – Gutter Music V.I.P. If you can call something a hit in “our scene” Starkey – Gutter Music VIP is a strong contender. Its wild and dirty beats should make any crowd move. Darkstar got some really wicked tracks. No different with the Videotape tune that is the Darkstar version of the Radiohead tune from the In Rainbows album. Although a bit unusual style it is still very awesome. I’ve actually been walking around humming on Videotape for the last few days. Floating Points has made a nice tune called Esthian III. Time for some acoustic guitar from Sunken Foal. I’ve been enjoying this tune too. Love it! WLTA makes your head nod n appreciation. Love the fat beats (I really mean fat – my ears feel like they are stuffed with cotton after listening to Teebs too loud). Another great tune! Nosaj Thing brings us lovely music that I find a bit hard to describe so just listen to the sound clip. The last track by Legion Of Two got a dark feeling to it and the drums sounds acoustic. Not my fave track as I’m not a fan of the more industrial kind of sound. What do you think about the Mary Anne Hobbs – Wild Angels compilation? Please use the contact page if you want Core News to review your release. Sounds like a wicked time. Saw here once in Oslo and she played a real nice selection.